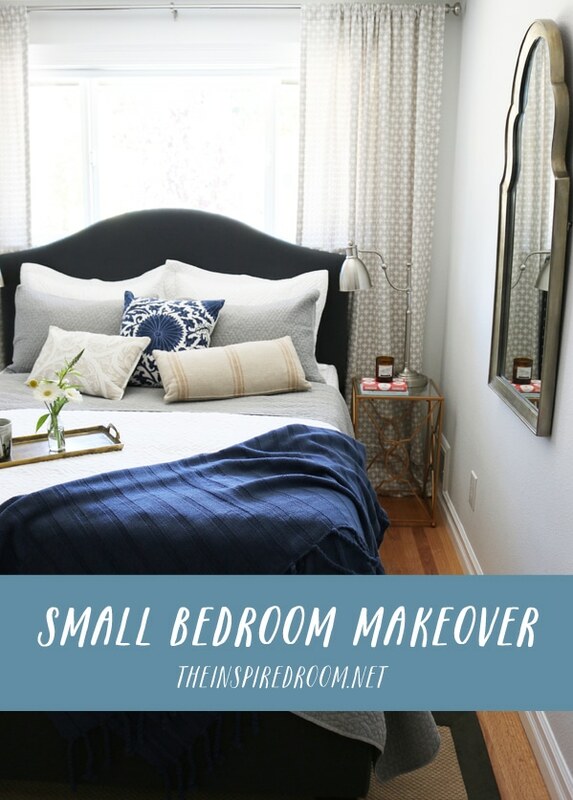 Welcome to our small bedroom makeover! I’m so excited to finally show you (for the first time!) this small bedroom on our main floor. And even better, you’ll get to see both the before and after makeover photos today! 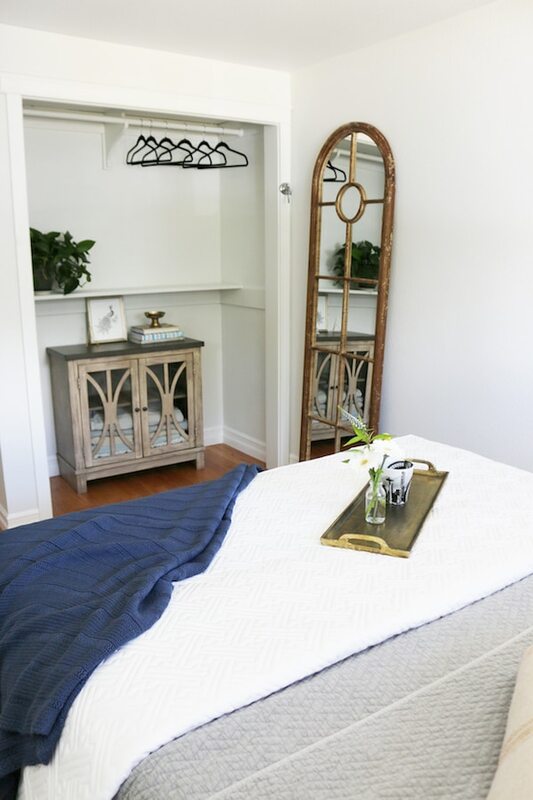 While I originally thought this little bedroom would work best for an office, after I tried it out for a few months (fortunately before decorating it) I realized that it was just a pinch too small and cramped to be inviting and comfortable for my work. I’ll share more on the new office in a future post. As we were starting to move the office furniture downstairs, Ashley HomeStore contacted me about doing a fun room makeover project. I was asked to create a before and after of a newly furnished space! That sounded like a splendid idea to me (I’ve been craving a finished room in this house). Since this room was going to be empty, it was the obvious choice for this project. I was thrilled to have the nudge to make this unoccupied space into a comfortable guest room, which we really needed. Although I had seen Ashley HomeStore around town I had never stopped in. I’m so glad I was introduced to their furniture because they have some really great pieces. 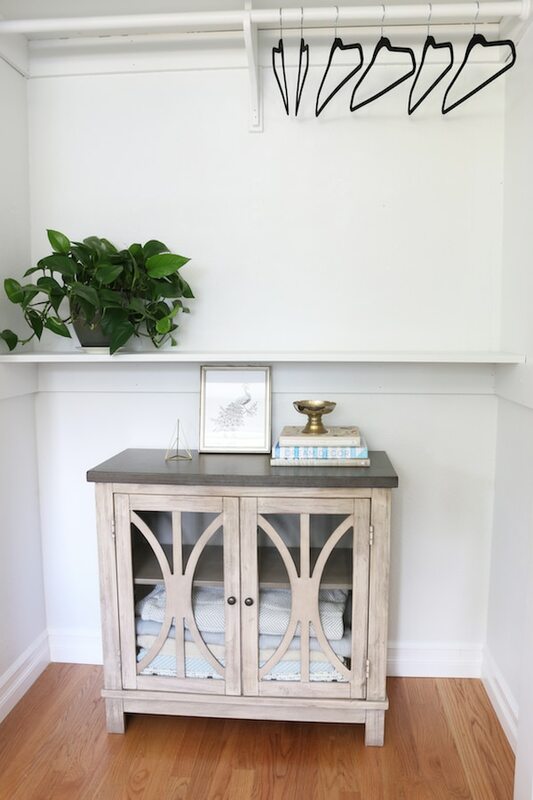 I’m excited to have been able to incorporate several really neat things from Ashley HomeStore in my small bedroom makeover. Before I tell you about the updates, this is the before photo of this room. 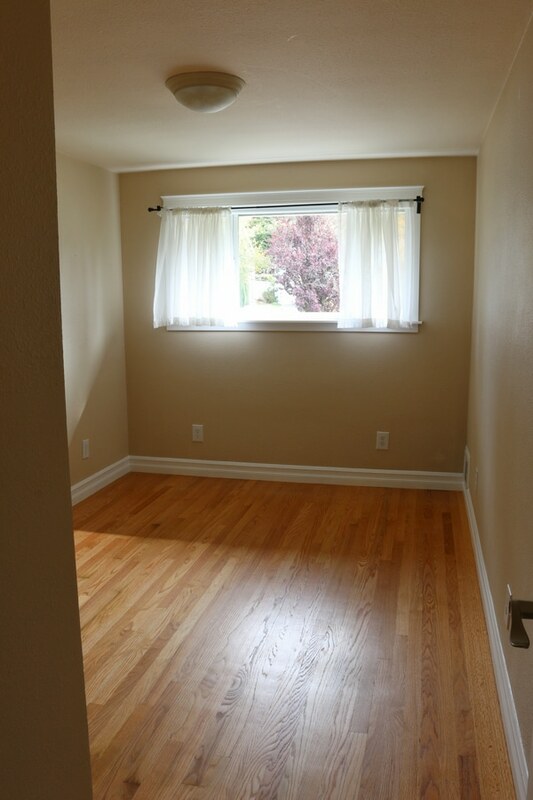 Even though it is a tiny room as you can see, it had three things going for it: nice baseboard moldings, hardwood floors and a bright cheery window. The challenge with this room is obviously that it is SMALL! I knew I wanted a queen sized bed for guests, but worried that it wouldn’t fit. But after carefully measuring and selecting the right pieces, I was able to fit both a queen bed and small nightstands. 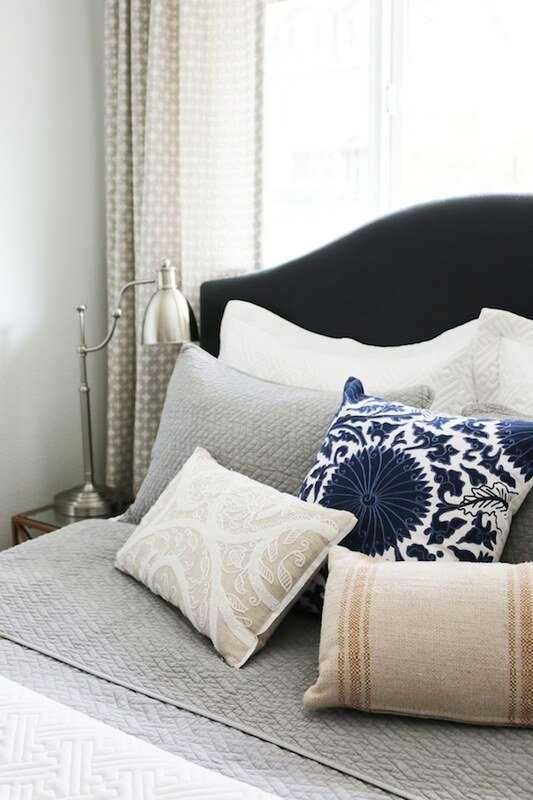 The upholstered dark gray bed with nailhead trim is really nice and makes a great statement. I especially liked that it had a fully cushioned frame but not a tall footboard because with such a tiny room it would have felt too cramped. This bed was just right. My parents have already stayed with us in the new guest room and I’m happy to say they LOVED it. The bed was really comfortable (we got the mattress from Ashley HomeStore, too). The quilts are SO soft and luxurious! 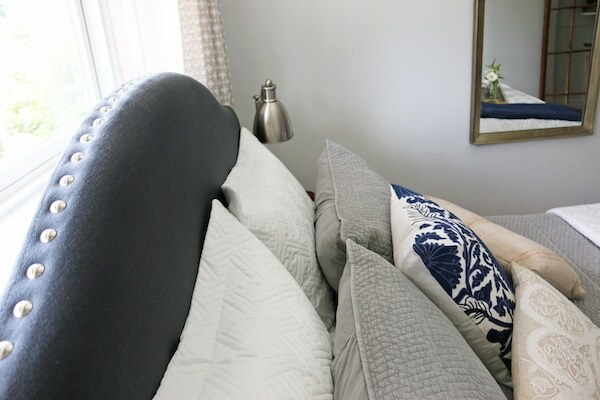 We layered a couple of bedding sets together. 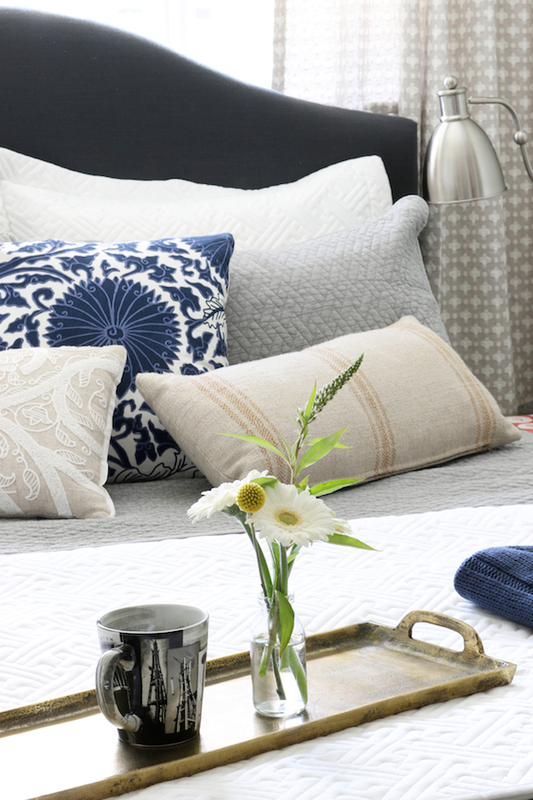 Not only does it look great to have a mix of bedding, but it’s nice to offer guests options. The adorable little glass and gold nesting tables are so airy. I was pleased to find ones that were appropriately scaled for either side of the bed. The cute apothecary lamps sat comfortably on the tables to offer guests plenty of light to read at night. 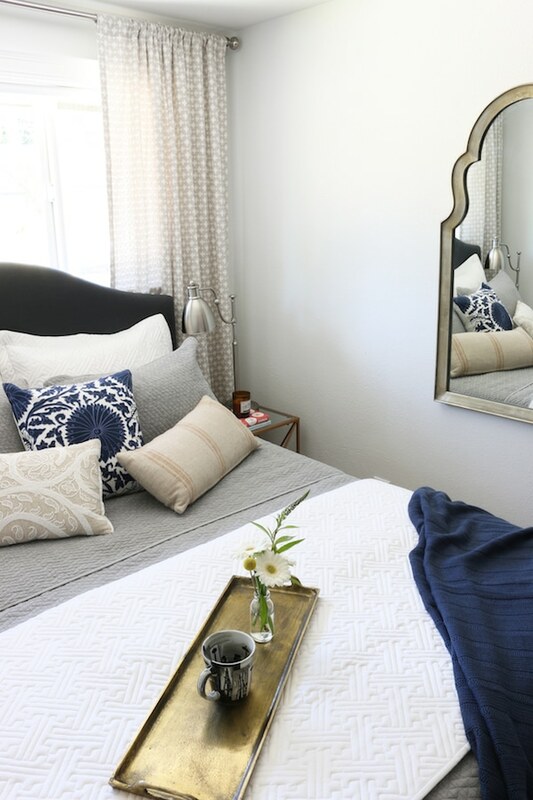 Because it’s such a little room the main things I really wanted in the room were mirrors to reflect light and allow guests to get ready for the day in their room. We selected two mirrors I LOVE. 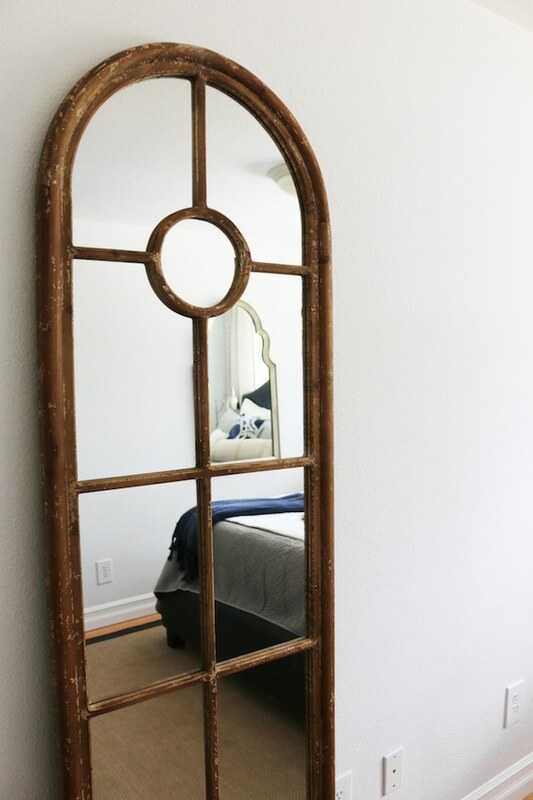 A full length mirror adds a textural weathered element to the room. I love it! It’s so nice to be able to see your full outfit. 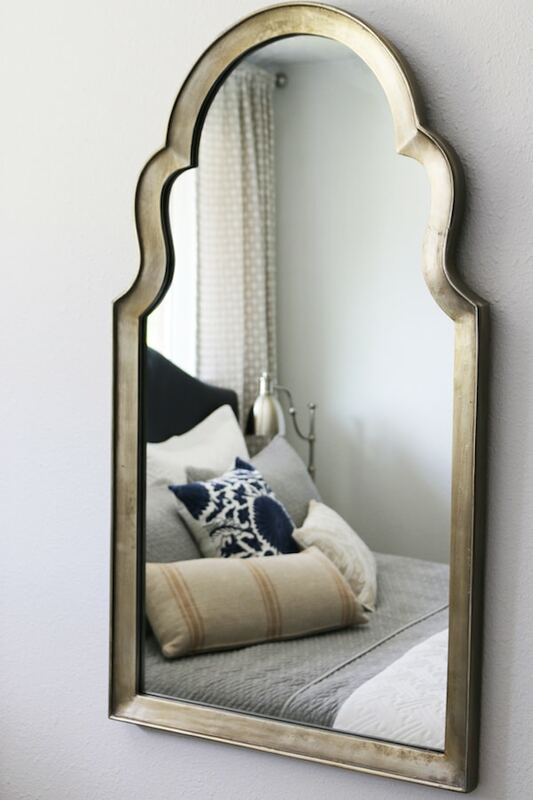 This gold mirror is one of my favorite pieces now! The antiqued finish is so pretty and the arched top adds a little curve to the space. 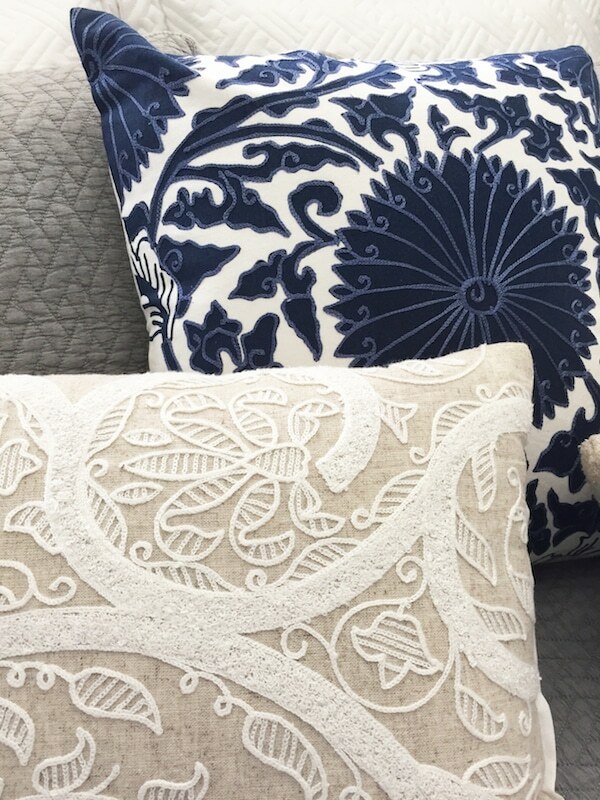 The throw pillow are gorgeous, I was super impressed with the quality and style. 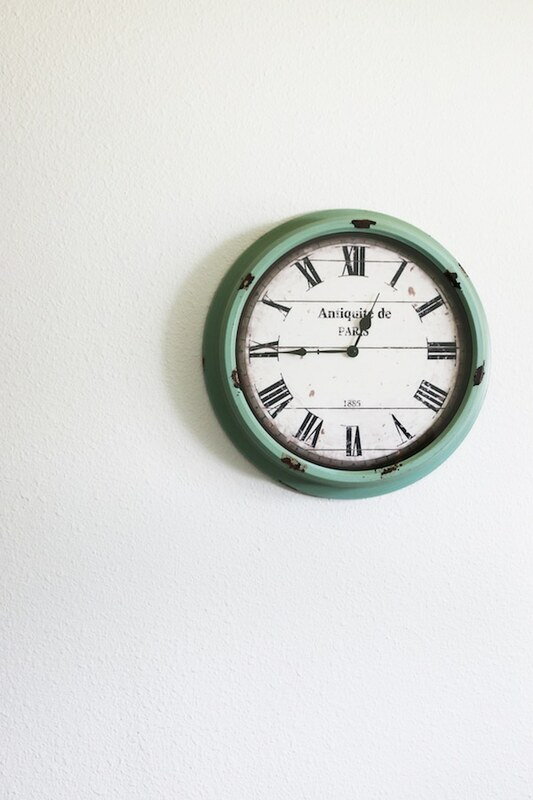 We also adore this green wall clock. Since most people travel with cell phones we didn’t think we needed to offer a traditional alarm clock but this one is both handy and cute on the wall. The gold tray is really amazing and another of my favorite elements. It’s super heavy and looks really cool in the room. We thought it was a fun idea to have it on the bed when a guest arrives. 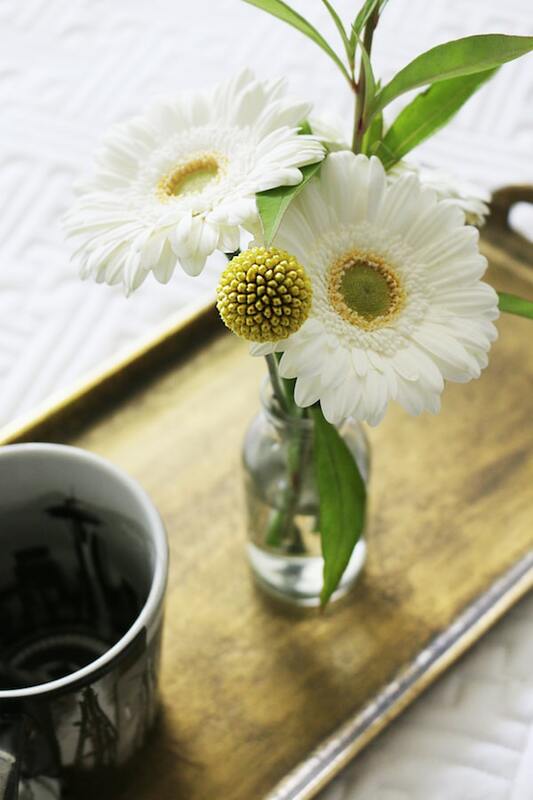 It’s perfect for a little bouquet and a gift of a souvenir Seattle coffee mug for their morning coffee. 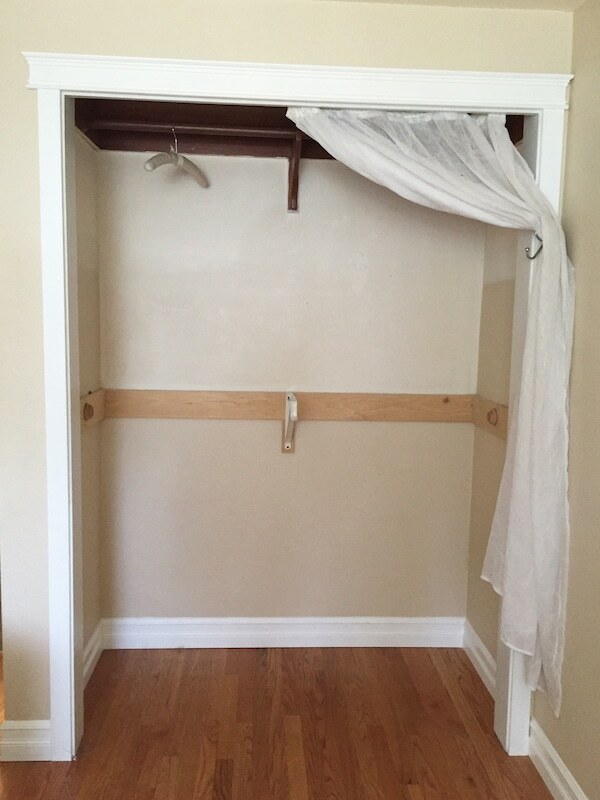 This is the before photo of the closet area. Since this is such a tiny room we wanted to freshen up the closet area. We decided to leave it open without doors or curtains so the nook would feel more like a part of the room. Now it’s a nice little spot for guests to set their suitcase and hang some clothes. This sweet little cabinet tucked in perfectly to the nook. 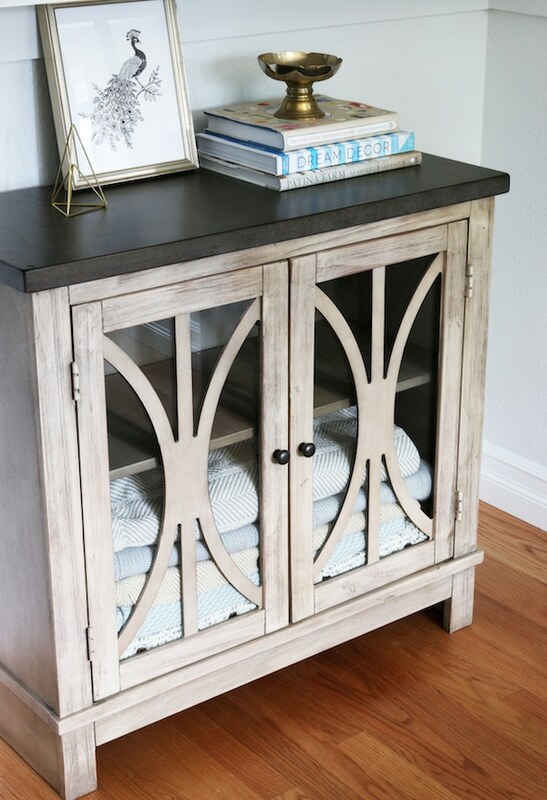 It is so sturdy and offers room for extra blankets and for guests to stash a few things if they are staying awhile. The throw blankets are really fun to toss on the bedding as a finishing touch. I like the tassel trim! The jute rug is a nice cozy addition to the space, too. It adds a little more warmth and really helps to quiet the room. So now that you’ve seen the room and all the beautiful items in it, here’s a final look at the before and after. Ahhh, I LOVE IT! I’m so excited to have a fun new space that feels complete but that I can still change up for my guests all year round. I also discovered that it is the perfect escape for ME during all the craziness around our house. 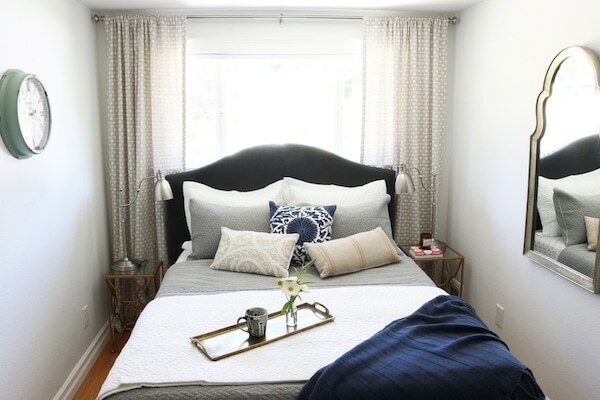 We have been in huge project completion mode in several other rooms in our house so I prop myself up on this bed at least once a day to relax and just enjoy a finished space. 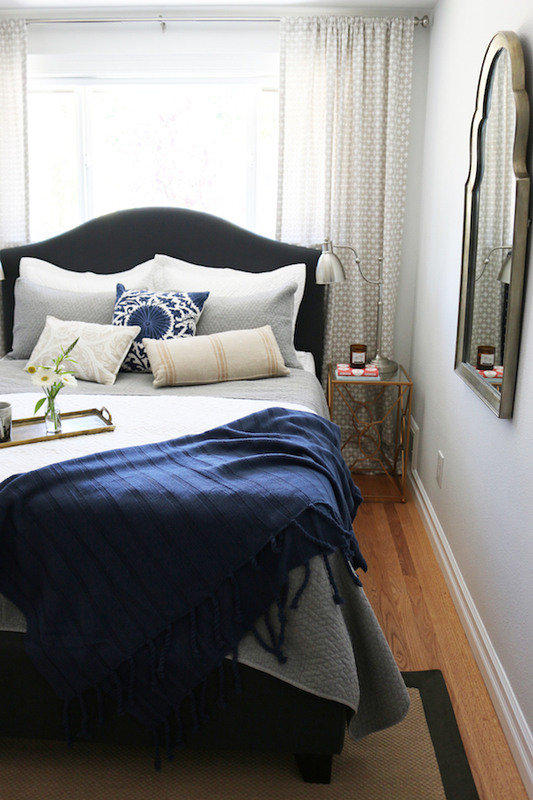 Thanks for stopping by for my small bedroom makeover, I’ll have lots more updates from our house coming up soon so stay tuned. 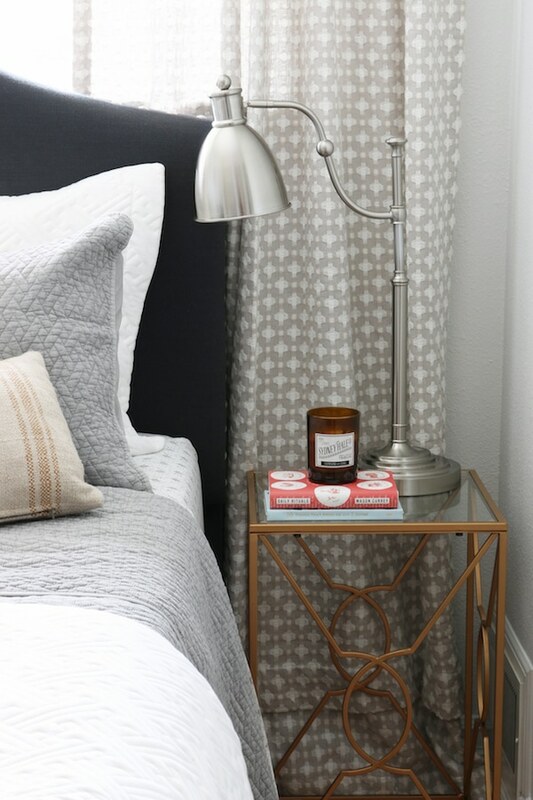 See more updates to this bedroom here! 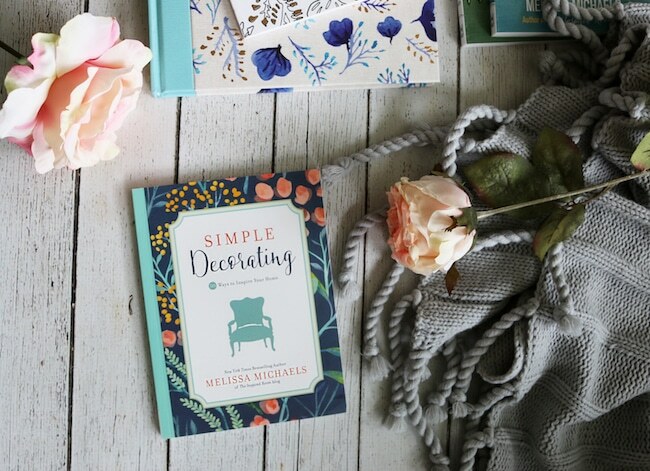 Click here for 7 quick tips to transform your space! At some point, everyone experiences the stress of moving. I know we did in our recent move. As a result of leaving your previous comfort zone and the disruption of your routines, you will naturally feel a bit disoriented. Moving takes everything we’ve grown familiar with and turns it upside down. It’s no wonder moving is stressful! 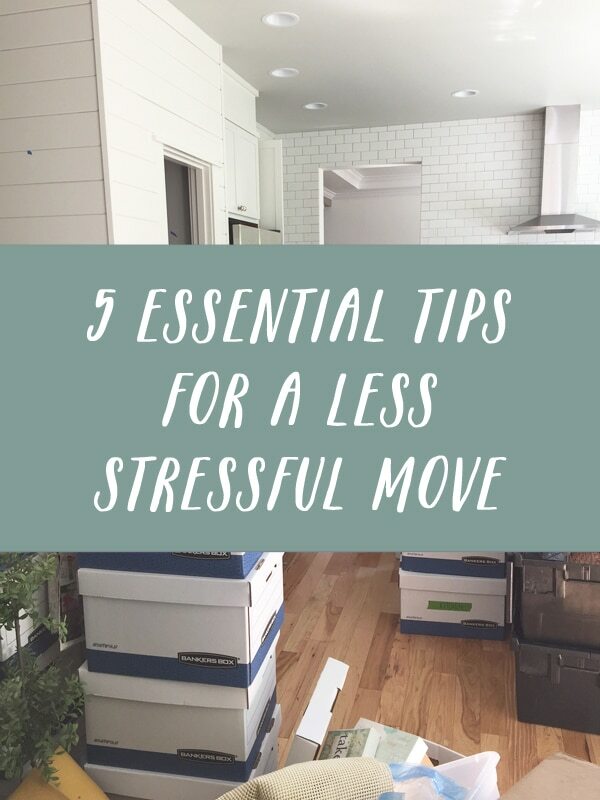 Being prepared and organized throughout the moving process will help you avoid (or at least reduce) the amount of stress and anxiety you experience. I am sharing my five essential tips for making any move much less stressful over at The Decluttered Home today. If you are moving or plan to move down the road, I hope you’ll find the tips helpful. Be sure to pin it for later and I would love it if you shared the post with your friends and family who are moving this summer! Read the full moving post here.